Home>Entertainment> Halle Berry Training With UFC's Cris Cyborg For "John Wick 3"
In preparation for her upcoming role in "John Wick 3: Parabellum," Halle Berry has reportedly been doing some heavy MMA training including a recent session with UFC star Cris Cyborg at her gym in Huntington Beach, California. The 52-year old movie star took to instagram to share a face-off photo with Cyborg, along with the caption, "From the red carpet to the ring 😂 - so inspired by your tenacity, @criscyborg - can’t thank you enough for your hospitality! @peterleethomas @criscyborggym." "John Wick 3: Parabellum" is set to hit theaters in May 2019. Cyborg (20-1, 1 no-contest) will take on Amanda Nunes (16-4) in the co-main event of the highly anticipated UFC 232 PPV on December 29. Cyborg, the Women's Featherweight champion, last fought in March at UFC 222 when she defeated Yana Kunitskaya by way of first round TKO. 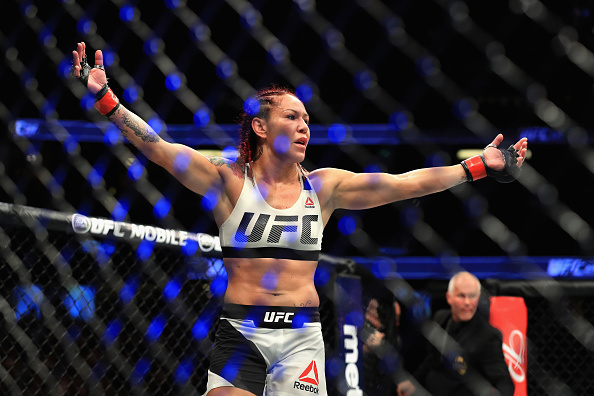 In a recent interview with Fansided, Cyborg spoke about 'teaching Nunes a lesson' when they step into the octagon one month from now. UFC 232, taking place at the T-Mobile Arena, features a stacked card including Jon Jones vs Alexander Gustafsson for the Light Heavyweight championship, as well as Carlos Condit vs Michael Chiesa and Chad Mendes vs AlexanderVolkanovski in a Featherweight showdown. ENTERTAINMENT Halle Berry Training With UFC's Cris Cyborg For "John Wick 3"